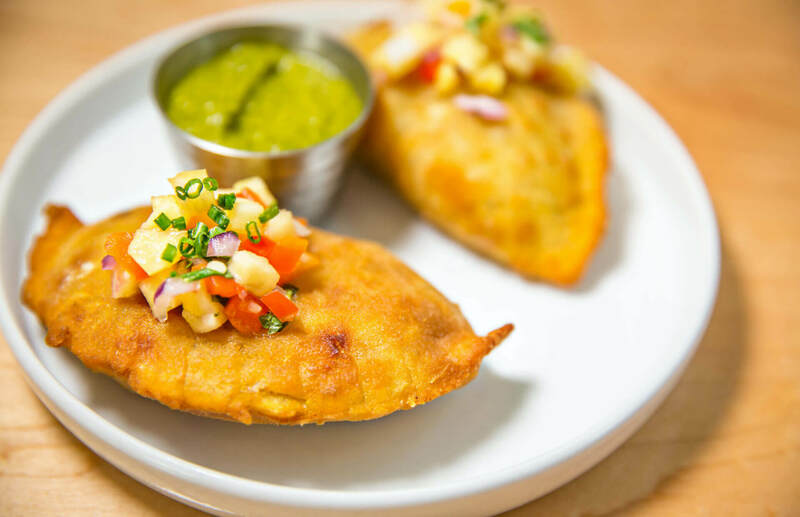 You’ll probably have some leftover empanada filling, and that’s OK. It’s versatile. Use it as a vegetarian filling for tacos, burritos, tostadas, enchiladas or other Mexican dishes. Savorez chefs deep-fry empanadas served at the restaurant, but this baked version is easier. If you don’t feel like making empanada dough, substitute frozen puff pastry or pie crust. Stir together flour and salt in a large bowl. Scatter the butter over the flour. Use a pastry cutter to cut the butter into the flour until butter is incorporated and mixture resembles cornmeal. Using a fork, stir in just enough water until the dough comes together. Knead 5 to 6 times, being careful not to overmix. Place all ingredients in a large bowl and toss together. Roll out half of the dough to ¼ inch thick. Cut out 4-5-inch rounds, larger if you’d like. Place about 2 tablespoons of the filling at the center of each round. Fold the dough over to encase the filling, making a half moon shape. Use the tines of a fork to seal the edges. Empanadas may be frozen at this point. Arrange empanadas on the baking sheets. Whisk together the egg and water. Brush the empanadas with the egg mixture. Bake the empanadas one pan at a time (refrigerate the other pan until time to bake) until they are golden brown, about 30 minutes. Chipotles packed in adobo sauce make this a super spicy side dish. If you and your crowd are not heat lovers, start with half of a single chipotle and a little of the sauce and increase from there.